It ain't easy to be me — God . 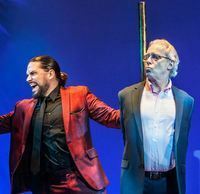 New York theatergoers have waited fifteen years to see Jerry Springer - The Opera, the essentially sung-through musical by Richard Thomas (music and lyrics) and Stewart Lee (book and additional lyrics). It ran for more than a year in London where it was awarded four Laurence Olivier Awards including Best New Musical in 2003. We can thank the adventurous New Group for bringing this long-awaited show to their home in New York. I'm going to assume that while we may not be fans, all of us have heard of the incredibly popular day-time tabloid TV show that began airing in 1992. It began as a political talk show but in the pursuit of better ratings moved towards a raunchier format with its host giving time and a platform to a variety of arguably deplorable (there's that word again) types to air their suppressed secrets often in the presence of a loved one. Under the banner of entertainment, people from real life used the opportunity to vociferously and/or violently expose their true natures in ways that both shocked and amused millions of viewers. I'm wondering, however, if the times have really changed enough since then so that the exploitation of people who live outside our society's view of normalcy is no longer acceptable? Judging by the audience reaction at the performance I attended, no one and nothing is yet beyond the pale. About that opera title. . .that's not a mistake. Some mighty glorious voices are belting out the octave-soaring notes and potty-mouthed lyrics that composer Thomas and collaborator Lee have conjoined with an astounding reverence for this well-regarded musical form. This is not to imply that Thomas can join the ranks of either the high-brow composers like Verdi or of the brilliantly low-brow Kurt Weill (the latter's Three Penny Opera being as close to the gutter in its theme as is this Springer opus). Marrying a libretto calculated to shock with lots of elegant music that thrills is quite a feat. Act I is basically a lampoon of the TV show in which Springer (played by a terrifically nonchalant, essentially non-singing Terrence Mann welcomes guests of all sizes and shapes and mental states. They appear to have no qualms about revealing the quirks in their personalities or their sexual preferences. In fact, they seem eager to do so. All are seriously disturbed, if not necessarily deranged. Happily, all have show-stopping voices to die for. You can take that literally. Those attending the show are the audience in the TV studio. Some in the cast, however, are occasionally assigned to sit as members of the audience with the expressed purpose of heckling the guests. Compounding the chaos, lovers and would-be enablers of the guests react demonstrably to the unfolding perversities. Far be it from me to spoil the revelations or the joy that comes with this opera's bursts of music amid the mayhem. It was a brilliant idea to stage the opera in the relatively small venue instead of in a big Broadway house. The audience is up close up and personal to all the relentless but funny exhibitionism that provides the key to a plot that doesn't begin to jell until Springer gets shot by a studio malcontent — thus moving things into the realm of tragedy common in so many operas. Except for an epilogue, the remainder of the opera takes place in Purgatory and Hell where Springer lingers between life and death. Scenic Designer Derek McLane works his magic on settings that make their transition with ease. A kind of inquisition becomes the catalyst for what might be called an intentionally blasphemous allegory. The audience is no longer simply having fun as gawkers of bad behavior. Springer is now facing those contestants whose lives have subsequently been ruined by him and the TV show. Also present are God and Satan and a host of the most sacred luminaries from religious lore and mythology. They include Mary and Jesus, the Angels Gabriel and Michael, and Adam and Eve, all of whom have their foul-mouthed say in arias that are best described as hilariously acrid. The joint down below really jumps as these characters begin to make confessions of their own in the appropriately outlandish costumes designed by Sara Laux. The seventeen-member cast is terrific in multiple roles. The standout rabble-rouser in chief is the sensationally diabolical Will Swenson as Satan. I should mention that Swenson also earns kudos early in the opera as the TV show's Warm-Up Man. As the tone of the opera turns darker we see the role that TV plays as an arbiter of bad taste and as a harbinger of things to come. Inexplicably, some of the sheer fun and pure lunacy of the opera is lost, however, with characters we have enjoyed as unrestrained dupes in Act I appearing as broadly satirical deities in Act II. To be completely fair, Act I earns its laughs largely courtesy of the lewd and crude deployment of the worst in human behavior. Act II gets a little too dead serious. But dead or alive that behavior is put entertainingly on display under the splendidly abetting guidance of director John Rando. At one point choreographer Chris Bailey puts the spotlight on an earnest chorus line of tapping white sheet-clad members of the Klu Klux Klan singing "This is my KKK Moment." This is perhaps, a little too chilling in the light of the recent Charlottesville demonstrations. While we are certainly warmed up to laugh at the perversions of some abnormal people, it's likely to be a little harder for some of us more normal folk to laugh at the hell fire and brimstone(d) entities above and below us — all of whom are reflections of humankind at its most shocking and despicable. One aria sums it up pretty well: "We Eat, Excrete and Watch TV." Editor's Note: In 2003 our London critic, like most of her fellow Londoners was completely over the moon about this show. To read her review go here. Cast: Terrence Mann as Jerry and Will Swenson as The Devil; Jennifer Allen, Florrie Bagel, Brandon Contreras, Sean Patrick Doyle, Bradley Greer, Luke Grooms, Nathaniel Hackmann, Billy Hepfinger, Justin Keyes, Beth Kirkpatrick, Elizabeth Loyacano, Tiffany Mann, Jill Paice, Kim Steele and Nichole Turner. From 1/23/18; opening 2/22/18; closing 4/01/18.